You knew we were going to get to these eventually. They’ve actually been on the list since the beginning, we have them on DVD, but we kept holding off on them, keeping Doctor Who as a sort of fallback option for when we ran out of other stuff or got too tired of terrible things. And then that didn’t happen. So one day last week we just decided to finally re-watch these. I have very fond memories of the first time I watched this episode. It introduced David Tennant’s Doctor and I loved it. I loved it a little less on this viewing. The murderous robot Santas and trees are still fun, but a lot of this hour is humans being whiny. 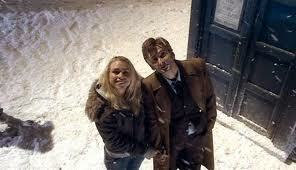 Whenever Tennant is on it really picks up, but there’s a big boring chunk in the middle without him. The writers were still sort of trying things out with Ten at this point; his character doesn’t solidify for a bit, and that adds to the surreality of watching this episode. Plus the end with Harriet Jones is kinda nasty and makes me sad. I still love the scene with the Doctor and the “big red button”, though. DONNA! 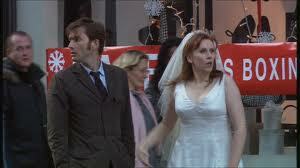 I would like this episode for giving me Donna even if I didn’t like anything else about it. But I do like a lot about it. Ten’s all busted up over the end of the last season, and that affects how he acts here, but this adventure stands enough on its own with the crazy Queen of the spider-things and the deadly Christmas Star Spaceship. And Donna. She’s sometimes a bit of a joke here, but still full of sparks and determination. I’m not sure why the Santa-bots are so much more badass in this one, though. I always forget about this one, but it’s quite fun. Erin had a good point as we were watching it, that the killer angel robots on the Space Titanic were a lot less scary now that we’ve had so much from the Weeping Angels, but they’re still cool, because: robots. This is a survival story set on a cruise liner crashing (naturally) towards Earth. If you’re a Brit-com fan, there are familiar faces like Geoffrey Palmer and Clive Smith, who both turn in great performances here. Actually, all the guest stars are pretty awesome in this one, and the story is great. Parts of the climax and end are really a bit too hokey, though I really like the very end. This is the one I hardly ever go back and watch, but I think it might have been my favorite on this year’s viewing.